A perfect snack made with the help of little hands! 1. Wash your hands and put on your apron. Preheat the oven to 350°. 2. With the help of an adult, place the dates, almonds, oats and salt into a food processor. Pulse the mixture to a fine crumb. Add in the vegetable oil and pulse again. 3. Divide the granola mixture between 12 muffin cups. Firmly pack the granola into the bottom and the sides, leaving enough room to fill with yogurt. 4. Let the adult place the muffin tin into the oven and bake for 12-13 minutes. 5. Meanwhile, rinse the food processor out with water and place back on the base. With the help of an adult, place the yogurt and freeze dried strawberries into the food processor and pulse until smooth. Reserve for later. 6. Let the adult remove the granola cups from the oven and let cool completely. 7. Now it's time to decorate! Remove the cups from the pan and place on a plate. 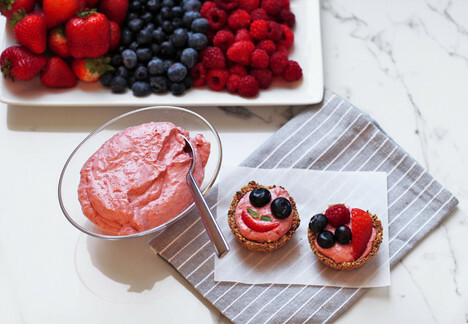 Add yogurt and decorate with the berries. Try to make a smiley face! Tip: These granola cups hold well, when loosely wrapped on a tray. Follow the instructions above, but skip the decorating until ready to eat. These will make a great after school snack and activity!